I started out thinking these little gals were wasps, but now I think that's the wrong trail. Are they leafcutting bees? They seem too small. This looks to be a male solitary bee in the family Halictidae, genus Halictus. 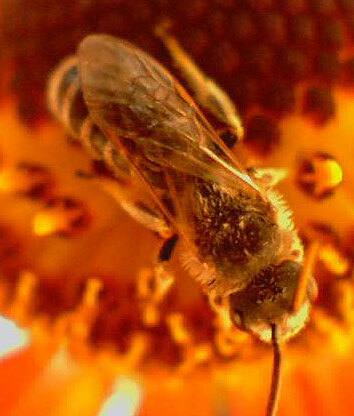 Note lack of hairs on legs for collecting pollen, the proportionately elongate abdomen, and relatively long antennae (compared to females). Hurray, yes, Halictus does seem right. Thanks to both of you. Eric, can you suggest a good insect guide for the PNW? I love beetles and bees interest me. We have good dragonfly and butterfly guides. I have Petersons and the Audubon book, but they favor the East Coast more.